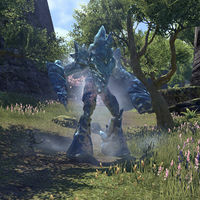 Frost Atronachs are a variety of Daedra composed of ice. As they are considered elite creatures, frost atronachs are immune to all forms of crowd control effects. As they are Daedric creatures, frost atronachs are especially vulnerable to Fighters Guild abilities. A basic melee attack that does moderate frost damage. The atronach swings its left arm, dealing high frost damage as well as knocking back all enemies as indicated by a red cone. The atronach stomps, and icicles burst from the ground as indicated by four red circles. This attack does moderate frost damage over time, and should be avoided. The player should be ready to move as soon as this attack is cast, as one circle will always appear under the player's feet. This page was last modified on 4 August 2018, at 16:55.